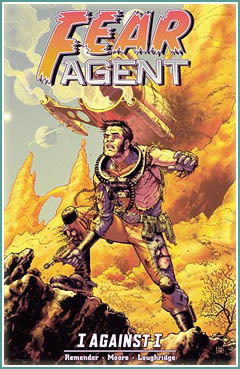 Rick Remender’s FEAR Agent – the comic book tales of Heath Huston, hard-drinking alien exterminator in a retro future – is being developed for the screen at Universal. I’ve liked the series, and not only for its occasional homage to Wally Wood (or to Jeff Brewer’s Cool Rockets, for that matter). Right out of the gate the stories had me going when Heath, in the middle of a pitched battle with aliens, was trying to figure out if they were intelligent enough that he’d get prosecuted for killing them. It’s a difficult future this guy has to contend with. The series started at Image Comics and then made a slightly unusual sidestep over to Dark Horse. I wondered at the time whether this might have something to do with Dark Horse’s media contacts, and maybe I was right to wonder. It’s early days, but this film – if it makes it through the gauntlet – could be loads of cliffhanging, drunken fun with Heath and his intelligent spaceship roaming the galaxy and getting into trouble. The news appears at the Risky Biz blog, and my thanks go to to Sci Fi Wire for pointing me that way. 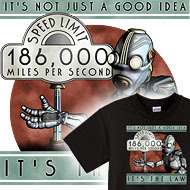 In a surprising instance of somewhat academic thoroughness, Discover magazine has cited my “Speed Limit” tee shirts in what is (otherwise?) a pretty impressive article about near lightspeed travel using pulse drives – whether the altogether possible nuclear version, or the “hey, maybe in a hundred years” antimatter version. So this whole “women in tubes” thing was preying on my mind, and apparently my mind wasn’t careful enough down by the waterhole… judging by this in-progress scene. What I’m liking in here (though you can’t really see why, yet) is that it’s a setting that’s guaranteed to seem ominous and sinister, but it won’t be. In fact it’ll be sort of cozy, in an unlikely way. And so, much more Retropolitan in character. Just a pretty rough layout so far, though I have been experimenting with the lighting because that’s going to be pretty important to the picture. It’s a slow rendering already even though I’m not including the more distant tubes that’ll stretch down the hallway, which will just get composited in at the end. Many lights. Many reflections. Much glass. I’ve already chosen a title, which is the name of a 1936 song by Milton Pascal and Edgar Fairchild. Late nights at the Astro Cafe, in the retro future world of Retropolis: ah, the memories! This diner offers anything a spaceman, spacewoman, or robot might want after a night’s revelry, or after a night of dodging space pirates, which is not the same thing. 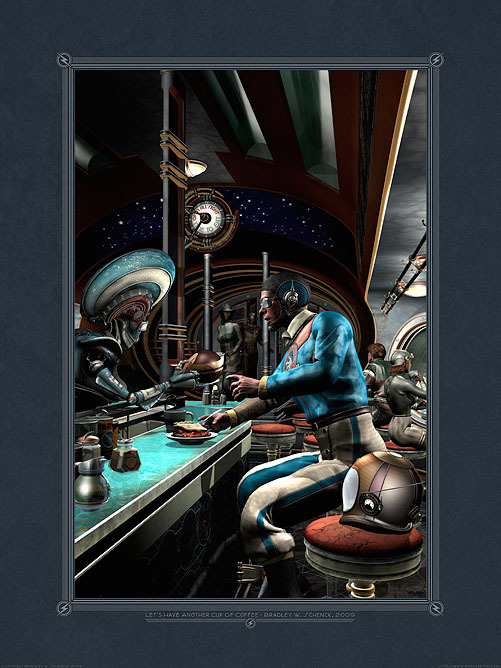 Park your rocket, cadet, and have yourself a steaming hot cup of joe. 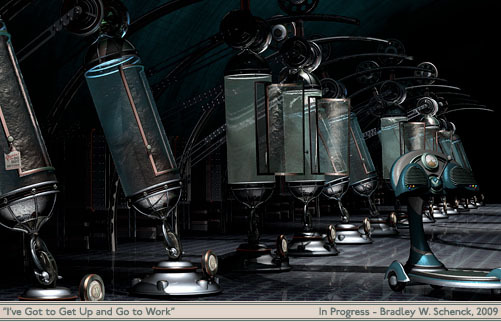 As usual, this was done with a combination of 3DS Max and Photoshop. It’s the second of what may be three pictures set in my diner of the Future That Never Was. This one, like the first, has a title from Irving Berlin’s “Let’s Have Another Cup of Coffee”. Because my future is just like that. Still: no women in tubes. Part of me feels wistful about how that might have improved things. Available as a poster, an archival print, and a postcard. 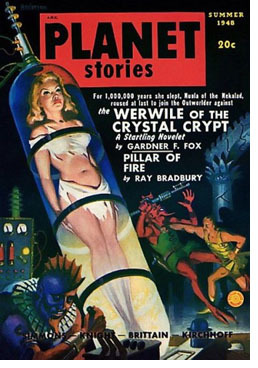 Posthuman Blues has been posting a series of what I never dreamed is an indispensable theme in golden age science fiction pulps: women in tubes! I wish that Mac’s posts were tagged so that I could link to the whole series, but if you browse through the posts you can find them. Who knew that this was a subconscious imperative that retro science fiction simply must express? And as you might imagine, I’ve searched my own work for tube women and I have to confess that I come up short. I feel completely inadequate, in fact. I have a feeling that I’m just going to have to do something about that before long*. I mean, sure, I’ve put toasters in globes… but no girls in tubes? What the heck was I thinking? And I wish that I were as clever as the commenter who called them “Tubular Belles”, too. *Update: Yep, I couldn’t resist.